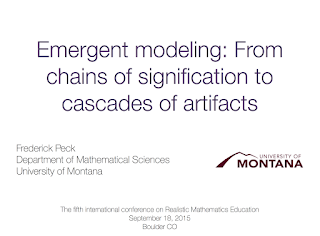 I gave this talk at the Fifth International Conference on Realistic Mathematics Education in Boulder CO. It's a somewhat theoretical talk. Emergent modeling is a key design principle in RME. 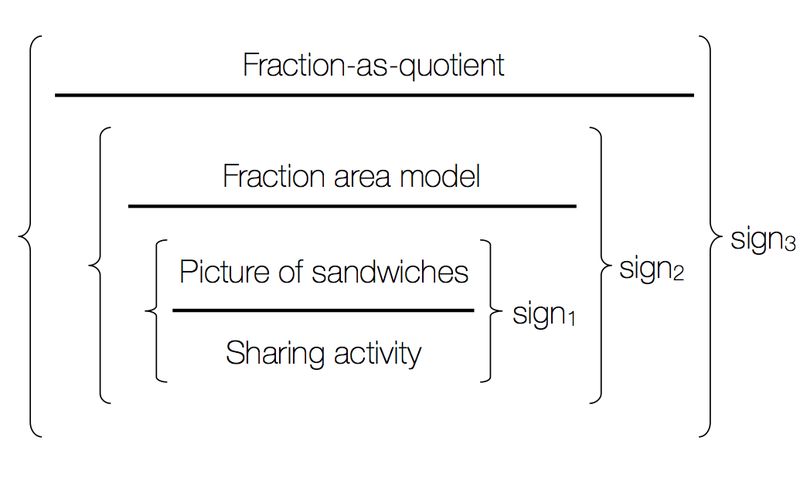 The process of emergent modeling is often described using a construct from semiotics called a chain of signification. I show that chains of signification are inadequate to describe both the process and product of emergent modeling. To overcome these inadequacies, I introduce a new construct called the cascade of artifacts. I conclude with implications for research and design. Often, in RME, we see the process of emergent modeling as a hierarchical process in which progressively more formal versions of a model emerge in linear sequence. This is described as creating a "chain of signification:"
In this talk, I argued that the construct of a chain of signification is an inadequate representation of both the process and product of emergent modeling. 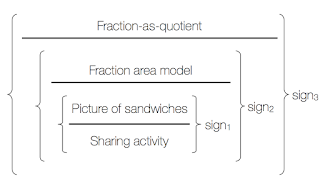 As a representation of the process of emergent modeling, a chain of signification is inadequate because it requires a strict one-to-one mapping between signifier and signified. As a representation of the product of emergent modeling (viz. 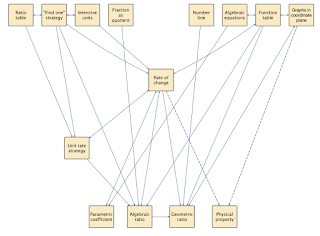 the students’ mathematical worlds), a chain of signification is inadequate because it implies that the mathematical world is hierarchical and siloed. Given the above shortcomings, I argued that emerged modeling is a process where students create new models, tools, and strategies as coordinated assemblies of existing mathematical objects. This happens as students engage in mathematical activity that is not accessible using their existing mathematics and social interaction. Visual representations of the cascade, like the one above, give researchers and teachers a representation of both the process of emergent modeling (how objects get assembled and coordinated to make new objects), and the product (the mathematical world). With respect to the latter, the cascade shows how the mathematical world is relational and web-like, and not hierarchal and siloed. 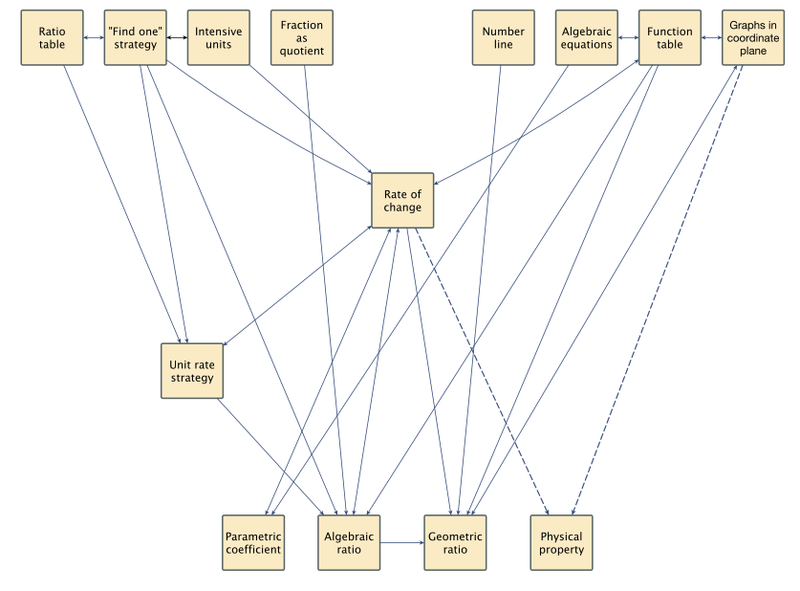 To learn more, download the presentation, and see the posts on slope (NCTM 2014, CCTM 2014) which exemplify the use of the cascade of artifacts.